JC Reckner has faithfully replicated MacDonald's winning 1963 ride in 1/25 scale. 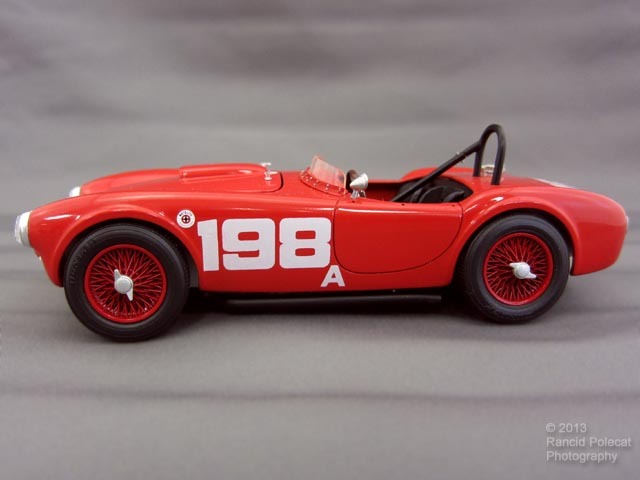 Based on an AMT 289 Cobra kit JC added Wheels and tires and brake duct scoops from Historic Racing Miniatures along with a fuel cap from Sakatsu. He also scratchbuilt the side mount exhaust system. Paint is Tamiya Italian Red and decals are Fred Cady items. Hood and trunk latch hardware was sourced from a Fujimi 427 S/C Cobra kit with a thin elastic cord for a trunk strap. He made headlight protective screens from clay sculpting wire mesh.